A few weeks ago, Pam from West Michigan Modern, stopped by to chat with me about the history & renovation of our home. When we bought the house, we did inherit a few old photos, but they weren't photos of the house in its' glory days. While the photos were not dated, I'd guess they were from the 1980's - 1990's. They are not photos of what the house looked like when the original family lived here, but I wish they were! Anyway, Pam got me thinking I should really see if I can track down the history of this house. I knew the original owner's name, since our neighbors have lived here since 1962 and remember him a bit. So, it all started with the name "Ted Tokarcyzk". That is all they remembered, but it was enough to track down some information, and even talk to some relatives on the phone. From his name, a quick online search found me his second wife's obituary. That gave me the name's of her children (Ted's stepchildren). I actually called Ted's stepdaughter, Cheri, and we chatted right before Christmas about how Ted drove to Tennessee with his own dump truck and picked up the stone that he used to put the fireplace together. She said he was quite particular and did all the stonework at the house himself. She said she remembered a planter around the light post in the yard, and unfortunately, either the planter is gone around the light post, or there was another light post that is missing from a planter. While Cheri never lived here because her mom married Ted when she was an adult, she also remembered the bathroom having a tub and separate shower, which she said was "fancy" for the times. She said she also remembered that they had a gas log in the fireplace, because her mother had a "beautiful birch gas log" at her previous home in Muskegon, that she took with her when she moved to this house in Grand Haven. Which solves my question of why there is a gas line running into our fireplace, but the previous owners had "real" fires with wood! She said the whole house was decorated in an "art deco" style and she loved visiting her mom while she lived here. She thought that the architect had studied under Frank Lloyd Wright, but did now know the name of the company. I also got to chat with one of Ted's sisters, Mary, who still lives here locally. Mary confirmed that Ted was married previously and had two sons, Ray & Vern, who both now live in Florida. She told me the architect, who she did not know the name of, also built a home for Ted's brother, Ed, in Spring Lake. Once Mary said it had a "round living room", I knew exactly what house it was, as I've admired it while we drive through Spring Lake on our way to Grand Rapids, as it's right on M-104. I've sent both of Ted's sons emails, but haven't heard back from either of them. I was hoping to chat with someone who actually lived here in the 60's! I have to imagine I'm typing this in my office, which was one of their childhood bedrooms. How fun would it be to see how it was originally decorated, and the furniture that was in place! Knowing how this home was used for the family it was built for is what I'd love to discover. Were there parties every weekend? Was that tiny half bath original to the home? Was the basement used for anything other than storage? Who laid the incredible stone patio that wraps around the entire house? So many questions! I also discovered, through a local Facebook group for our community, that another of Ted's sisters (he was one of eight) lives down the street from us. Her granddaughter replied to my plea for help post, and told me where she lived. 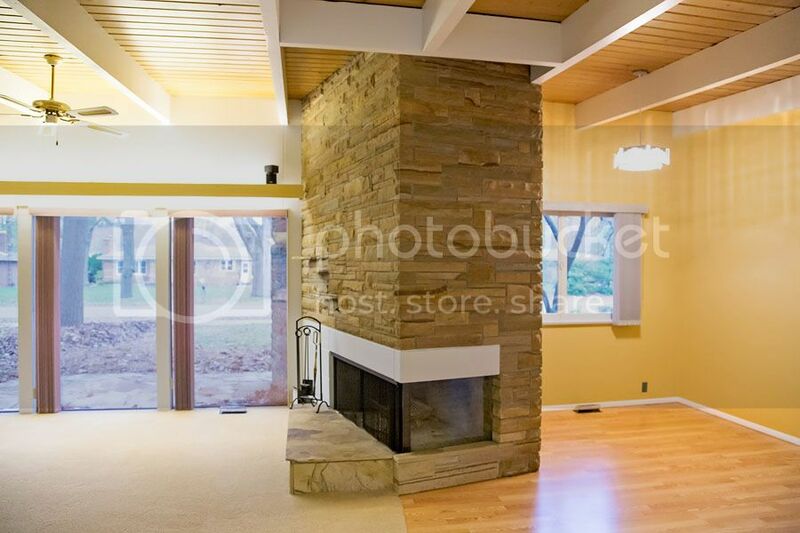 I knew straight away what house it is - it's a glorious 60's ranch with a fantastic fireplace and large living room windows that I've admired often on bike rides to the park. Her granddaughter told me her grandma was "Old School Grand Haven" and that I could just stop by anytime to chat with her - she's most likely LOVE the company and to talk about her brother and rest of their family. I am crazy (friendly!) enough to do this, and hope to have a chance to do so before the snow melts. And for now, I wait. Crossing my fingers that one of the original homeowners calls me back to share most about the history of this home with me!